Google's out with Android 2.2—codename: Froyo—and so far we're impressed. But what is it, exactly? Froyo (following Google's adorable alphabetized dessert naming convention) is the latest iteration of Android, Google's mobile operating system. Simple enough! 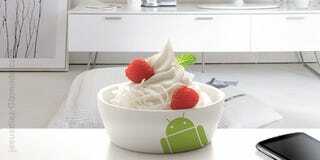 If you bought an Android phone recently, Froyo's what it will eventually be running. Aside from the nice touch of being greeted by an Android icon at start-up, Froyo users can also expect a new homescreen widget. There are some other minor aesthetic changes, and transitions and animations seem a bit smoother, but the user experience isn't all that different from using 2.1 on a Nexus One. Another piece of news we'd heard but are ecstatic to see confirmed: Froyo lets you turn your phone into a hotspot—including for your Wi-Fi iPad, if you're so inclined. (Or any other Wi-Fi device.) It's still not confirmed if every Android carrier will support tethering (AT&T? ), but Froyo's definitely capable. We'd heard previous reports that Android 2.2 was going to be ridiculously faster than Android 2.1, and today we saw it first hand: Froyo is up to 5x faster than Eclair, thanks to a just-in-time compiler. And that's just the OS; Google's also claiming that Froyo has the world's fastest mobile browser, period. Android 2.2 supports Flash 10.1—important, because Flash 10.1 is optimized to run on mobile devices. And more than finally killing off those little question mark cubes that litter the web on your phone, it'll also be a huge differentiator for Google in the fight against Apple. There's a line in the sand, and Adobe and Google are on the same side of it. It may turn out that Flash on mobiles is a bad idea, but at least now you'll have a choice. Speaking of leapfrogging the iPhone: with Froyo, when you download an app to your computer you don't need to tether your phone. Instead, the update will automatically be installed over-the-air to your device. Same goes with music you buy. Hear that, iPhone users? No syncing required. You'll also be able to stream your (non-DRM) iTunes library wirelessly to your Froyo phone. Froyo gives hardware compass access to the browser, handy for orienting maps according to which direction you're facing. You'll be able to access the camera from the browser, as well. Google continues to blur the difference between native and web apps. Other tidbits: voice recognition for search and for Google Translate—the latter of which, when plugged into text to speech, makes a handy speech-to-speech translator. There's also a handy new application manager that'll let you move apps to and run them off of an SD card and allows background updating. Congratulations, Nexus One users! You're guaranteed to be in the first Froyo update. Everyone else, you're just going to have to hold tight; firmware updates are largely up to the carriers and OEMs, and some poor saps only got their Android 2.1 upgrade in the last week. The more recent Android handsets should see an update in the next few months. You're caught up on Froyo!. Now you can check out what's going on with Google TV. Google TV was announced today. But what exactly is it? Give us two minutes.